So, I had a few bucks left on a Border's gift card a couple of weeks ago, and The Pioneer Woman happened to mention this book on her site. I have a lot of phobias. Seriously, a lot, people. 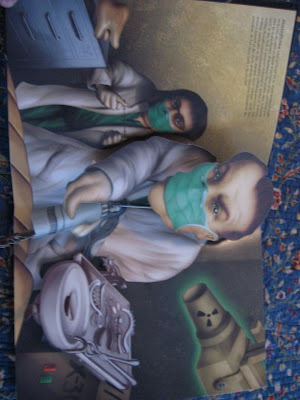 And I also love pop-up books (I still really want this one, internets. My birthday is two months. Thanks in advance). 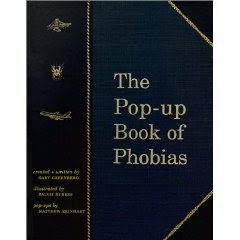 There are ten phobias illustrated in three-dimensional genius-ness and I suffer from a good third of them. Sad but true. Acute anxiety brought on by the intrusion or threat of intrusion of the oral-facial complex by a practitioner of dentistry. Pathological fear of exposure to unsanitary or disease-producing substances, including dirt, germs, mud, excrement and sputum. Profound distress caused by members of the class Arachnida. Intense dread of heights, often accompanied by vertigo. So what are you afraid of? The Appropriateness Police strike again. It was on the news so it must be true. This day just keeps getting suckier. Why do people even go there? Buy a cover-up and go away. Once again, I LIVE here. Number Ten and other stuff. Why some days I'm ashamed to be a female. Why I'm a horrible person.